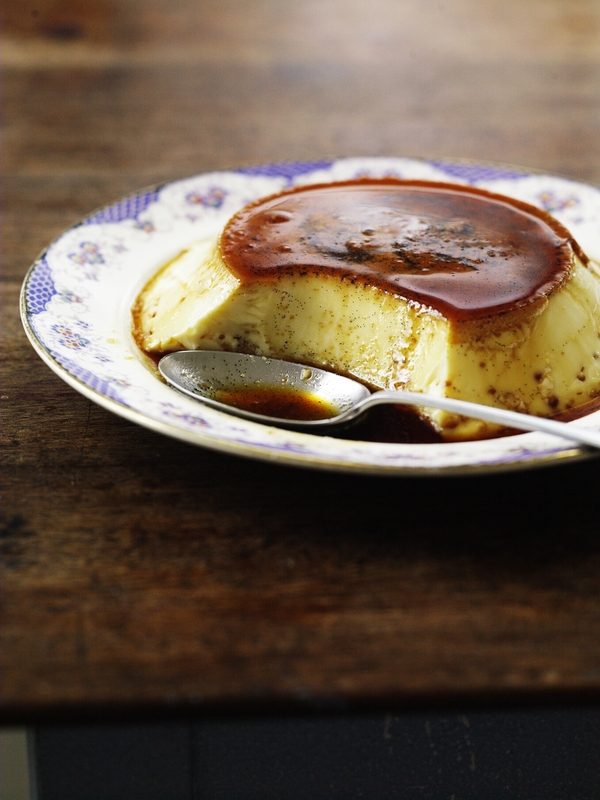 Every time I taste a good crème caramel, I become a little fonder of this easy-to-make milk pudding. I love its texture and the way you can almost cut it. My mum makes a birthday crème caramel for my dad; it’s his favourite. Last year’s was a particular triumph, with the smoothest texture of all her crème caramels to date. We put this down to the fact that her electric whisk had broken, so she had to incorporate the eggs into the hot milk and cream with a fork instead. To make the caramel, place a large, heavy-based pan over a low heat. Add 150g (51⁄2oz) of the sugar, and allow it to melt gradually. Try not to stir it too much, as it can begin to crystallize – the occasional shake and swirl will help things along, though. As soon as it’s melted evenly and looking golden, remove it from the heat. Pour the caramel into a heatproof dish roughly 25cm (10in) across and 5cm (2in) deep, or into 6 individual ramekins, then leave to set. Heat the oven to 150°C/300°F/gas mark 2. To make the custard, place the milk and cream in a large pan. Scrape the seeds from the vanilla pod and add them with the star anise to the milk and cream, along with the pod itself. Place the pan over a medium heat. As soon as the mixture begins to simmer, remove the pan from the heat and allow the creamy mixture to infuse for 10 minutes. Crack the whole eggs into a large bowl, then add the yolks and remaining sugar. Gradually pour the warm milk mixture into the eggs and sugar, using a fork to beat together as you go. Strain the mixture through a sieve into a jug, then pour it over the caramel. then refrigerate. Remove from the fridge 30 minutes before serving. When ready to serve, run a sharp knife around the rim to release the edge of the custard. Place a large plate over the top (or individual plates over each ramekin), then carefully invert so that the pudding pops out onto the plate. Serve with cream, and cooked plums if they’re in season.